Ella Lister rounds up the last of the auction news of 2018, paying particular attention to the seemingly unstoppable rise of Burgundy, which is having no difficulty in seeing off all comers. The fine-wine market was slow and steady in 2018. 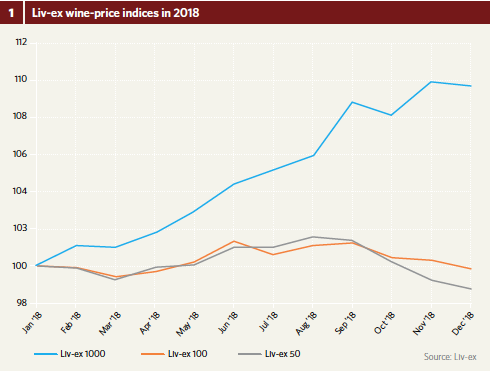 The Liv-ex 100 wine-price index finished the year flat and saw very little fluctuation month to month (fig.1). First-growth Bordeaux was stable, too, losing only 1 percent over the course of the year. Meanwhile, the Liv-ex 1000—a broader measure of the fine-wine market encompassing a wider range of wines outside of Bordeaux and a few other stalwarts—gained 10 percent in 2018. This hallowed region has seemed unstoppable for the past three years, and price rises accelerated faster than ever in 2018. However, December saw them drop for the first time in a year, and this continued in January 2019. This mirrors a pattern seen at the same time the previous year, when it was more marked, so it could well just be a blip. Brett-Smith believes the region’s ascendancy can continue “if the success of the 2017 Burgundy en primeur campaign is anything to go by,” elaborating, “Burgundy was more sensible on 2017 release pricing than Bordeaux.” And all other signs are that Burgundy will continue cruising along in the stratosphere. Statistics from Wine Lister show the region’s online search rank improved by 24 percent in the 24 months from January 2017, while Champagne’s remained flat, and regions such as Bordeaux, Piedmont, and California lost ground. Meanwhile, Burgundy’s top wines have the best Wine Lister scores of any major fine-wine region. Burgundy’s 50 top-scoring wines have an average Wine Lister score of 937, 20 points ahead of its Bordeaux counterparts, and more than 100 points ahead of Tuscany. 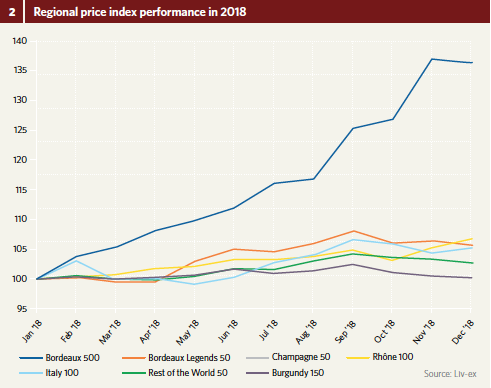 This is thanks to performing better than any other region in both the quality and economics categories of Wine Lister’s rating algorithm, reflecting high scores from the top critics, and strong price performance, among other economic indicators, such as volumes traded at auction. Only in brand strength are Burgundy’s top wines beaten to the top spot—by Bordeaux. What 2019 holds in store for the fine-wine market is less clear than ever. “I’m as muddled by 2019 as our politicians are,” declares Goedhuis. While we saw a successful 2017 Burgundy en primeur campaign in January this year, the 2018 Bordeaux en primeur campaign will not begin until May, after critics and trade have tasted samples in the first week of April. All indications are that it will be a great vintage; barrel-sample tastings at the end of 2018 were very promising, though it is hard to judge so early. If the quality is borne out, this could be another opportunity for the Bordelais to harness their indomitable brand strength and make back some ground, but you don’t need me to tell you it will depend on their approach to pricing. If the pound falls even further against the euro, it will reduce the UK’s buying power and make pricing an even more delicate matter. In more general terms, a falling pound can buoy the UK market temporarily, but only in relation to stock already paid for and held there. “If the pound were to fall, stock becomes attractive to foreign markets. In the short term it’s okay; but I don’t dare think what the long-term implications are,” says Goedhuis. For the complete version of Liquid Assets, please refer to Issue 63 of the print magazine.